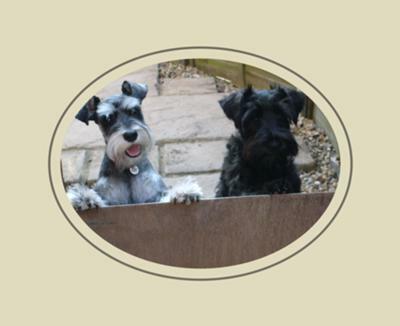 Millie and Dexter are 2 Miniature Schnauzers who belong to my son and daughter-in-law. I had never heard of "Schnauzers" before Millie joined the family. A year after Millie became part of our family, my daughter-in-law felt Millie should have a companion - thus Dexter joined us. I am very lucky to be allowed to have the dogs from time to time, and I love them just as much as Jackie, Neil and their sons do. They are wonderful in every respect, and when we visit we are made so welcome. My husband and I made a decision when our beloved dog died, that we would never have another dog, as the passing of a pet is too much to bear, but how lucky we are to be able to share Millie and Dexter. What fantastic puppies! Probably the best looking schnauzers in the world!